UPDATE: Man Killed In Accident on Route 34. Around Town, Home, Latest News, Police & Fire, Today's Events Comments Off on UPDATE: Man Killed In Accident on Route 34. On Monday, March 25, 2019, at 3:14 pm, the Orange Police Department responded to the westbound side of Derby Avenue just prior to Sodom Lane for a motor vehicle collision involving a pedestrian. The investigation is still on-going but it appears that a vehicle being driven by a 79-year-old female was traveling westbound on Derby Avenue when it drifted off the right side of the roadway for unknown reasons and struck a 45-year-old male who was standing to the rear of his flatbed tractor-trailer truck. The vehicle also struck the rear of the trailer and then careened into another vehicle traveling on Derby Avenue. The tractor-trailer had been parked off the right shoulder of the roadway after delivering a large piece of construction equipment to the area. The male pedestrian was transported to Yale-New Haven Hospital where he succumbed to his injuries. His identity is being withheld at this time pending notification of his family. The female vehicle operator also was transported to Yale-New Haven Hospital with unspecified injuries. The operator of the third vehicle was not injured. The westbound side of Derby Avenue was closed to traffic for several hours. 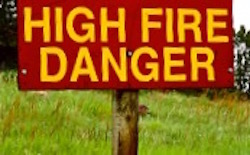 The Orange Fire Department was called to provide additional lighting to the scene. If anyone witnessed the collision or has any information, they may contact Lt. Raymond LaPlante of the Orange Accident Reconstruction Unit at 203-891-2130. RF Case #19-8906. 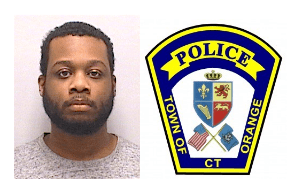 On March 17, at 5:53 p.m., Richard A. Gaskins, 22, of Milford turned himself in at the Orange Police Department on an active arrest warrant. He was taken into custody and charged with second-degree breach of peace, fifth-degree computer crimes, possession of voyeuristic material, and unauthorized procurement of telephone records. Gaskins received a promise to appear in court on April 1. Orange residents, do you know a veteran, male or female, especially from the Korean War. If so, the Orange Memorial Day Committee wants to know about him or her. The committee is honoring all veterans, however, this year’s theme is highlighting the Korean War veterans. 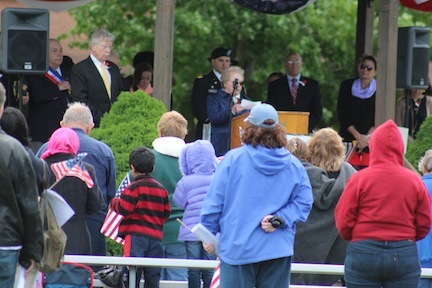 Every year, the committee carefully chooses veterans to honor during the Memorial Day ceremony on the Orange Fairgrounds before the parade. These veterans fill the roles of Grand Marshal, Chief of Staff, and Honored Veteran in the Memorial Day Parade. They are looking for Orange residents who were honorably discharged. There is a lot of planning and preparation that needs to be done, but nothing is as important as choosing candidates to recognize this year. If you have someone in mind, or if you know a veteran who would like to be considered please contact kelliemartino@yahoo.com or kgoldberg@orange-ct.gov or call 203-891-4738. 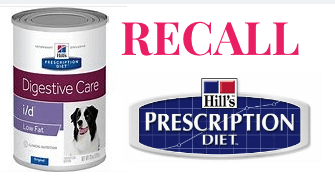 If you love your dog enough to buy them quality dog food, such as Hill’s Science Diet and Prescription Diet Canned Dog Foods, then you should be aware that there has been an extensive recall on many of these items due to elevated levels of Vitamin D.
Since the initial recall (which we had not been alerted to), hundreds of dogs have died from eating the food, and I truly hope that yours is not among them. Finally Spring, And A Full Moon! Around Town, Home, Latest News, Today's Events Comments Off on Finally Spring, And A Full Moon! 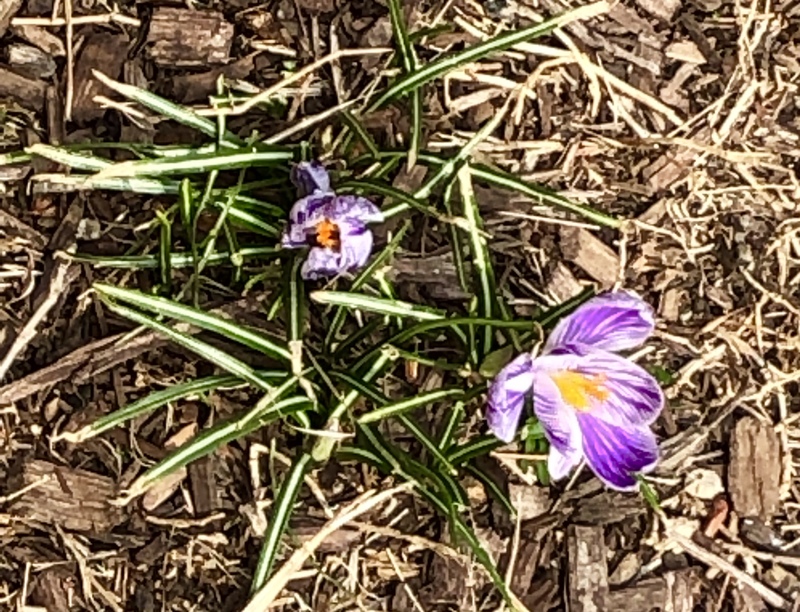 The crocuses have been popping up and robins are bopping around on lawns throughout Orange and surrounding towns. It looks like the Groundhog was right, winter is gone and Spring is upon us! According to the Old Farmers’ Almanac, the word equinox comes from the Latin words for “equal night” — aequus (equal) and nox (night). The spring equinox (also called the March equinox or vernal equinox) falls on Wednesday, March 20, 2019, at 5:58 p.m. The vernal equinox marks the end of winter, and the start of spring and the Full Worm Moon is named after the earthworms that emerge at this time of year. The Almanac goes on to say that the March full Moon is particularly special because it reaches its peak on the same day as the spring equinox, on March 20, 2019. The last time the full Moon and the spring equinox coincided this closely (4 hours apart) was in March 2000, but the last time they occurred on the same date was on March 20, 1981! But that’s not all: March’s full Moon also will be a supermoon, meaning that it will be slightly larger than most of the other full Moons this year. Flash needs a home. Not the Flash but rather a nice canine at Woodbridge Animal Control. Flash is a three-year-old, neutered, mixed breed dog in white with tan on his head. The lad is friendly, attentive, good with adults, children, and friendly dogs but no cats. He knows the basic commands and enjoys human company. What he needs is human attention and the comfort and stability of a loving family or individual. Come on down to the shelter at 135 Bradley Road, Woodbridge and meet Flash. In a few minutes, you will want to take him home. Flash and other dogs and cats are available for adoption at Woodbridge Municipal Animal Control. Call 203 389-5991. Found sleeping under a tree, Dude willingly accepted a ride to Woodbridge Regional Animal Control. Dude is male, mature adult American Bulldog, about 50 pounds in medium red with a splash of white on his chest. He is true to the breed as friendly, attentive, kind and loyal. Mr. D is good with adults, older children and friendly dogs with cats an unknown. With his laid back and charming personality, Dude has become a favorite at the shelter. With a little bit of luck, he can become your favorite too. Dude and other dogs and cats are available for adoption at the Woodbridge Regional Animal Control. The shelter is located at 135 Bradley Road, Woodbridge, and can be reached by phone at 203 389-5991. Dude with Animal Control Officer Ashley Sakelarakis. Planning on sending your kids to camp this summer? Here’s your opportunity to check out the staff and activities at Camp Argo, run by Orange residents Jason and Courtney Nevis. 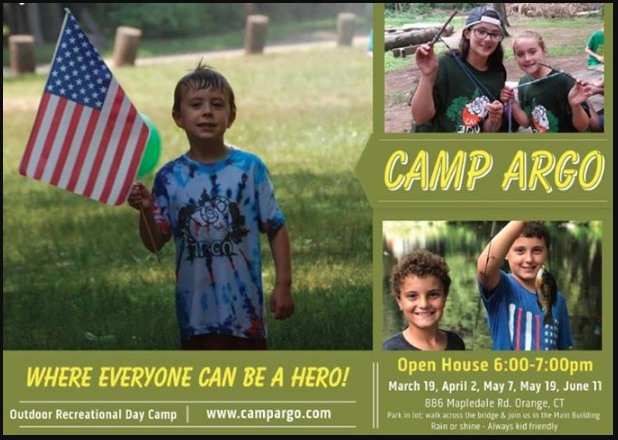 Camp Argo will host an open house at (Cedarcrest Campgrounds) 886 Mapledale Drive, Orange, on Tuesday, March 19 from 6 to 7 p.m. 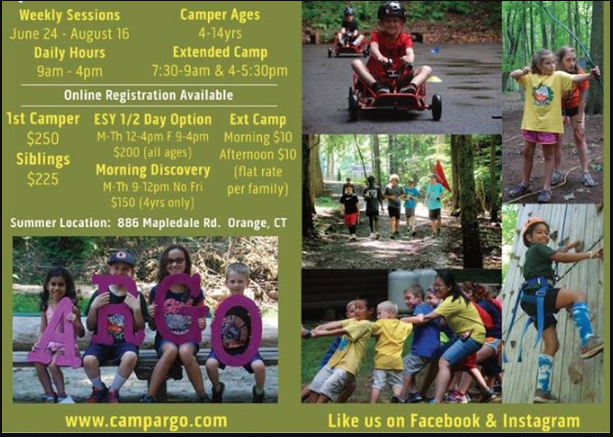 The Camp was featured on page 43 of the Summer 2018 edition of OrangeLife Magazine. Check it out.